After the tops the bench were completed I moved to the captured side panels. Being that they are captured inside the leg frames, I once again used the lumber core with the shop sawn walnut veneer. Using a shim and a plane iron to clean up the joints. After the joint below is glued, the radius can be shaped. 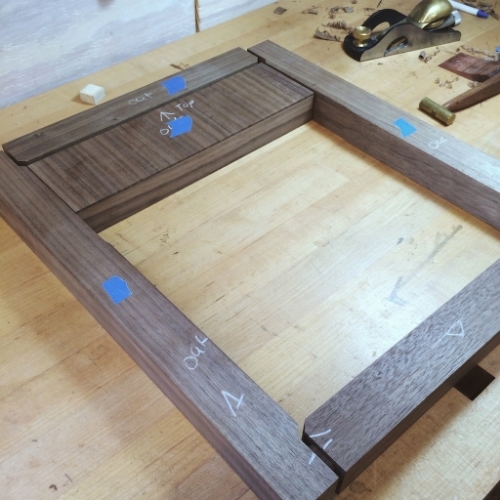 At this point there is also and extra 1/8" of material on the insides of all the frames. With the two bottom joints glued and radius shaped I can begin to remove the 1/8" of waste allotted for the radius. After the radius's were shaped in the bottom joints it was time to complete the joinery for the top. 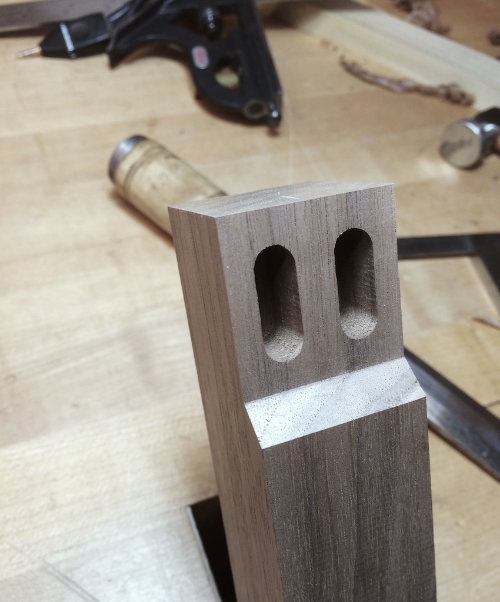 Here you can see the through mortise and tenon/captured panel assembly. Apologies for the long post, I had some catching up to do. From here it is on to joinery, assembly and dovetailing the drawer.